Enterprise Tondelli supply variations on this depending on the product to be handled and the accuracy required. One is a volumetric flow meter where the valve is calculating the exact volume in the bottle. This has the benefit of improving product yield and controlling costs. The valve is also self monitoring so as the closing mechanism wears the flow metre automatically compensates for this to give consistent fill volumes throughout the life of the valve. One flow meter is used per valve so that they are all independently adjustable giving greater control. The alternative is an electronic level filler which uses a probe to check the fill level in the bottle and then closes the valve accordingly. 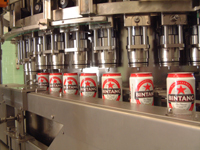 This is typically used on beer filling into glass bottles. 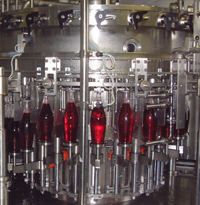 The fillers are available as a standard filler monobloced with bottle cleaner and capper or the unique hygienic “baseless” or upside-down filler . If you need hygiene and efficiency then you need “baseless”. Fillers from 12 to 140 valves have been supplied by Enterprise over the last 30 years so whatever your product Enterprise Tondelli can suggest the correct filling system to meet your needs.